Butter and sugar. There are few ingredients that make me happier than this pairing. The possibilities are endless. But one of my go to recipes when it comes to making cookies is sugar cookies. In full disclosure, I’ve never had much patience or luck with refrigerating batter and rolling out sugar cookies and cutting fun shapes. Instead, I make drop sugar cookies and get on my way. No waiting around for the batter to chill or rolling it out and hoping the cookie stays in one piece. Last weekend though, my laziness ingenuity took hold and I cut out the work of even dropping small balls of batter onto the cookie sheet. 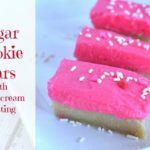 This time I poured all the batter into a baking dish and made Sugar Cookie Bars and let me see just say, they were amazing! I don’t know about you, but I despise store bought frosting. The flavor is always a little…off. Instead I always make my own homemade buttercream frosting which is quick, easy, and delicious. For this batch I added a little (ok, a lot of) gel food coloring to turn the frosting a bright pink and topped with sprinkles for a fun, early Valentine’s Day dessert! Take a recipe for traditional drop cookies and turn it into bars! Lightly spray 8x8 baking dish with cooking spray and set aside. Mix together flour, baking soda,and baking powder. Set aside. Using a stand or hand mixer, beat softened butter for several minutes until light and fluffy. Gradually combine sugar with butter and cream together until smooth. Add egg and vanilla to wet mix. One half cup at a time, add the dry mix to the wet mix until all ingredients are combined. Pour mix into prepared baking dish. Bake for 20-25 minutes in preheated oven. I like to cook my bars until they're just starting to turn golden so they have a softer consistency. For more delicious homemade cookie recipes that I’ve changed up, check out my Chocolate Chip Cookie Cake recipe! I wish I had some right now! They look amazingly delicious!! These look SO good. They remind me of those sugar cookies that my daughter adores so much! So pretty and pink, perfect for Valentine’s Day!! Oh, I love your idea of turning drops into bars. These are beautiful too! Pinned! Love them, and love the color too, perfect for Valentine’s Day! I’m going to pin it! Given the choice, I too prefer homemade frosting. These look delicious, and I wish I had some to eat as I watch the snow fall past the streetlights in front of my house. I am definitely pinning this for future use. Yum! One of these would definitely brighten my mood today. It’s so cold out, but a sweet treat would put a smile on my face. Oh such a simple but fun and brightly colored treat. Would be perfect for a spring party. These look yummy! I am a big fan of buttercream frosting! Oh my yum! These look delicious! I would eat so many of these! My kids would have to fight me for them. Oh I never thought to put it in a pan and bake it like that – I am so going to do that. I love buttercream frosting I have a recipe for a white chocolate one that is so good you just want to eat it all with a spoon! My favorite kind of cookie is chocolate chip, I have to say, but a soft sugar cookie is right behind it and these look delicious! Anything with buttercream frosting, though, can’t be bad. These would be so great for Valentine’s Day! 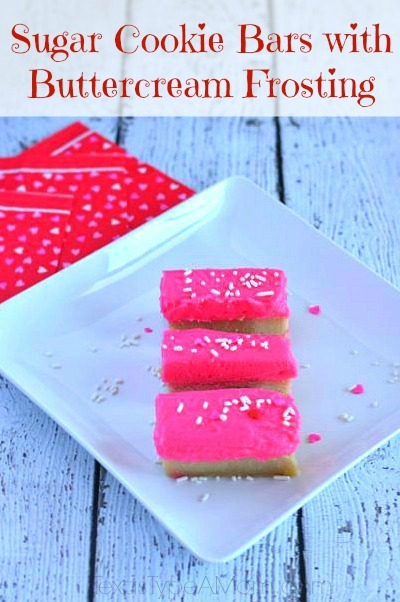 These look delish and I love the fun pink color! Wow! Those look awesome for parties! Sounds like a recipe that you can’t go wrong with! 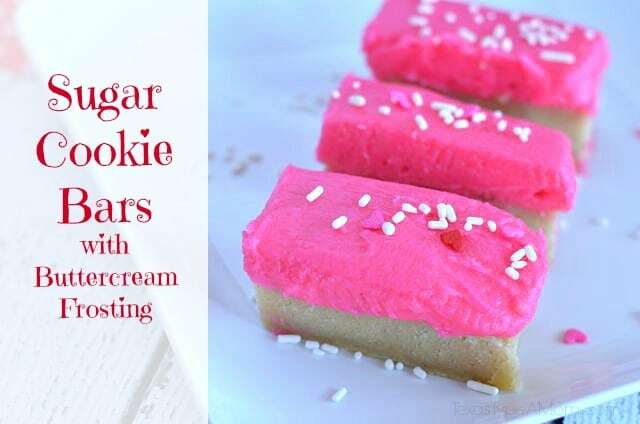 The pink is so perfect for Valentine’s Day and I prefer my sugar cookies frosted with buttercream frosting to the hard royal icings so these look great to me.